Got it today. Its gorgeous. Thanks so much Jill and Lisa!!! 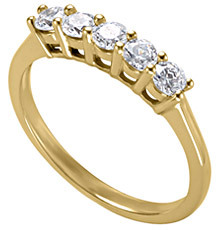 Beautifully designed, this 14k yellow gold 2 mm ring is prong set with five .10 carat diamonds, each with a color of G-H and a clarity of SI. Sorry, no written reviews yet. Our bridal product is made to order in the USA. Please allow 7 business days for manufacturing. For faster service, please contact us at experts@danforthdiamond.com.